There are truly some horrible people in this world. The still unknown owner of a Chevrolet Cruze hatchback is one of them. According to NBC News Las Vegas affiliate KSNV, a vandal poured an "acid-like substance” onto a parked Chevrolet Camaro while its owner was inside working at her desk. It all went down on Friday, April 5 in broad daylight when the culprit, for whatever reason(s), decided it would be fun to pour the substance on the back of Shawn Smith’s Camaro. Whatever it was, the substance immediately began to melt the paint. "It was bubbling as if it were boiling liquid,” Smith said. "It actually looks like burned marshmallows.” A passerby managed to witness what was happening and went inside Smith’s office to inform her what was happening. Her business partner, Danny Ericsen, then tried to chase down the vandal. "I told him wait right here, don't go anywhere, and I went around the back to take a picture of his license plate and he sped away,” Ericsen explained. But of course the guy didn’t wait right there. Instead, he hopped into his Cruze and, uh, cruised away. "We can't think of anybody who would intentionally do this. All of our clients are happy. We don't know. It's really weird,” Ericsen said. Fortunately, Ericsen managed to snap a photo of the guy’s license plate. 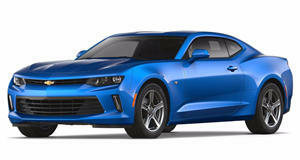 The Camaro is now at a local service dealership for repairs, which will amount to around $5,000. That’s why you have insurance. "The plastic, you’ll end up replacing. Chrome tips on the muffler, you’ll end up replacing. Metal, we can sand that down to the bare existence. We should be able to repaint it and make it good as new,” the service manager said. The act of aggression against the Camaro, and Smith, for that matter, appears to be completely random. But there is one thing that’s for certain: it was an intentional act.